They say that inventors should find a need and fill it. 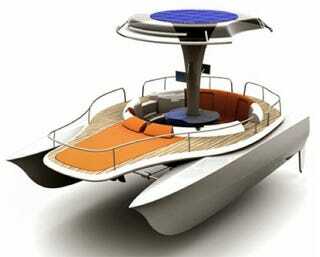 I don't know who needs a solar boosted pedal boat, but a design concept for one exists nonetheless. The boat features a center cockpit where up to four passengers can sit, alternating pedaling duties in two-person shifts. When you get tired (which should be after only a few minutes), switching to solar power can help lighten the load. I'm not sure if this concept will ever see the light of day, but in a world filled with non-solar powered pedal boats, it would be a welcome improvement. Video after the break.